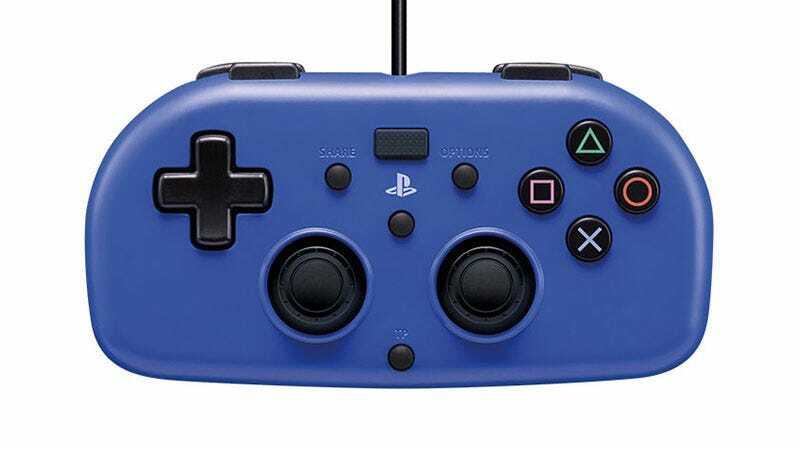 Sony has licensed Japanese peripheral company Hori to make a new controller for the PS4 called the Mini Wired Gamepad. It’s designed for kids (and adults with small hands, I guess? ), and I am very upset it wasn’t called the Kidsaxis. Like the name suggests, it’s wired (with a 10ft cable) and is 40% smaller than a DualShock 4. It also ships in a very nice shade of PlayStation blue. It’ll be selling for $30, and will be out this holidays. All of which sounds good! Now for the catch: “this controller does not include some features of DualShock 4, including a touch pad, light bar, stereo headset jack, speaker, vibration, or motion sensing”. Ah, so that’s why it’s only $30. At least the touch pad still works, kinda; there’s a button in the middle that replicates the effect of clicking on the touchpad.